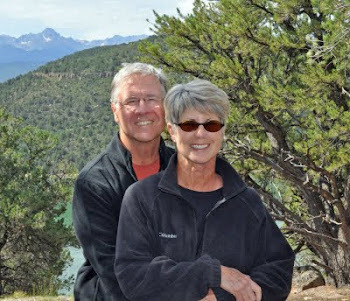 Find us on Google+ Rick and JoAnne's RV Travels: Oct 13, 2010 The Earth...and Beyond! Oct 13, 2010 The Earth...and Beyond! Last night (Tues, the 12th) we attended a Star Party at the McDonald Observatory; where they had five high-power telescopes, an excellent instructor (with the most powerful green laser), and were treated to a magnificent spectacle of stars. If you have never been to a Star Party…I would strongly recommend it. Not only fun and educational, but seeing the stars, the moon, the “red spot” on Jupiter, constellations, the Hubble, a satellite, and another galaxy was fascinating, thrilling and breathtaking! We got up early this morning and headed to the Chihuahuan Desert Nature Center & Botanical Gardens, which is part of the Chihuahuan Desert Research Institute. You will be able to tell from some of the pictures the diversity of the cactus and plants in this arid region of Texas. Note to self: Remember to bring a hat, and wear good walking shoes. On our way “back home” we saw a sign for a Pioneer Cemetery - Of course we had to stop at an old cemetery! It was tucked in the back of some houses, seemingly forgotten by others. Just another reminder of the hard times these courageous people endured. Returning to our campsite - Rick went to the top of the mountain to make some business calls, and I wanted to try a new recipe, and do some knitting. While putting some of the storage containers in the outside storage area I heard a noise right behind me. I turned, and a deer walked right up to me and had this “what are you going to do” kind of look at me. I had left the screen door open, and not knowing what was going to happen, after a few seconds, I slid up the side of the rig, walked backwards into it, closed the door and of course…grabbed my camera. Tomorrow we leave this cool place and head to parts unknown. A great place for adventure, excitement, variety, wildlife…and you can’t beat the price of camping here…full hook-ups and even cable TV for $20 a night. You have been seeing so very much and a lot of history of America. A great trip and the pictures are super!!! Hope you are having a great time and do not bring home any strange animals!!! Oct 20, 2010 The Missions…and ME!!! Oct 19, 2010 Well...You Can Plan the Plan! Oct 17, 2010 This Place is Amazing! Oct 16, 2010 We Could Get Used to This! Oct 15, 2010 Annie Riggs…what a woman! Oct 11, 2010 The Night of the Javelinas! Oct 10, 2010 Altitude in Texas! Oct 9, 2010 A Creature Visits! Oct 5, 2010 Beauty all around us! Oct 1-2, 2010 Surprises…all the way around!